The Sun reaches its most northerly place in the sky at the summer solstice on the 20th, regarded by many as the start of summer in our northern hemisphere. Contradictorily, though, the days around then are also classed as midsummer though the actual days of any midsummer celebrations vary from country to country. More sensibly, in my view, the Met Office defines summer to span the months of June to August which would place the middle of summer in mid-July and, consequently, means that summer begins on June 1. The solstice occurs late on the 20th, at 23:34 BST, while sunrise/sunset times for Edinburgh change from 04:35/21:47 on the 1st, to 04:26/22:03 on the 20th and 04:31/22:02 on the 30th. 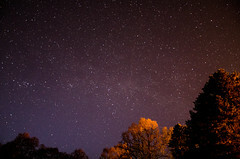 Scotland’s nights remain twilight throughout, with little hope of spotting the fainter stars and, from the north of the country, only the brighter stars and planets may be seen. One is the beautiful ringed world Saturn which stands opposite the Sun in the sky on June 3, only twelve days after Mars’ closest opposition since 2005. 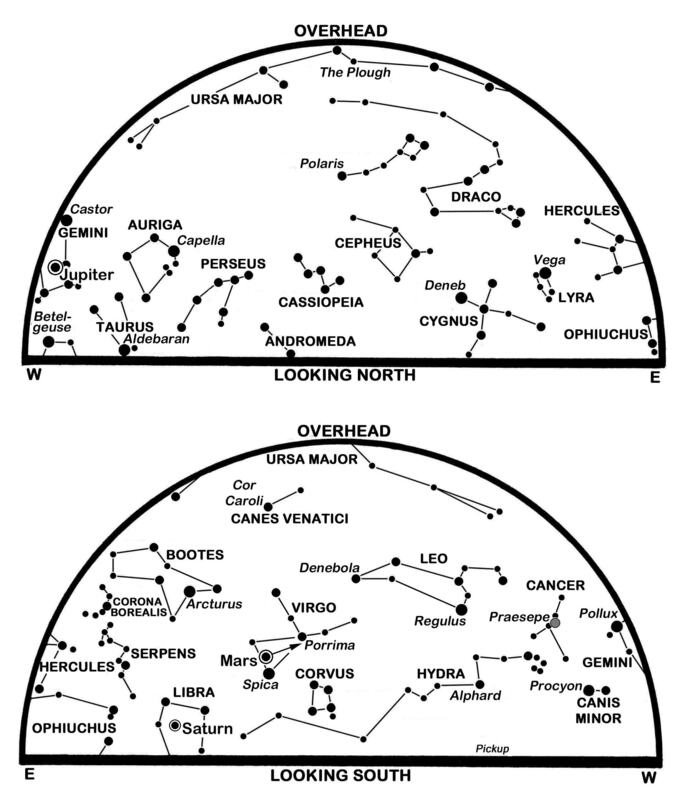 Both planets shine brightly in the south at our star map times as they track westwards across the sky. Unfortunately, Saturn climbs less than 14° above Edinburgh’s horizon and Mars is a degree or so lower still so telescopic views are hindered by their low altitudes. Having stood at its closest (75 million km) on May 30, Mars fades from magnitude -2.0 to -1.5 as it recedes to 86 million km while telescopes show it contracting from almost 19 to 16 arcseconds in diameter, still large enough to show some detail on the disk. 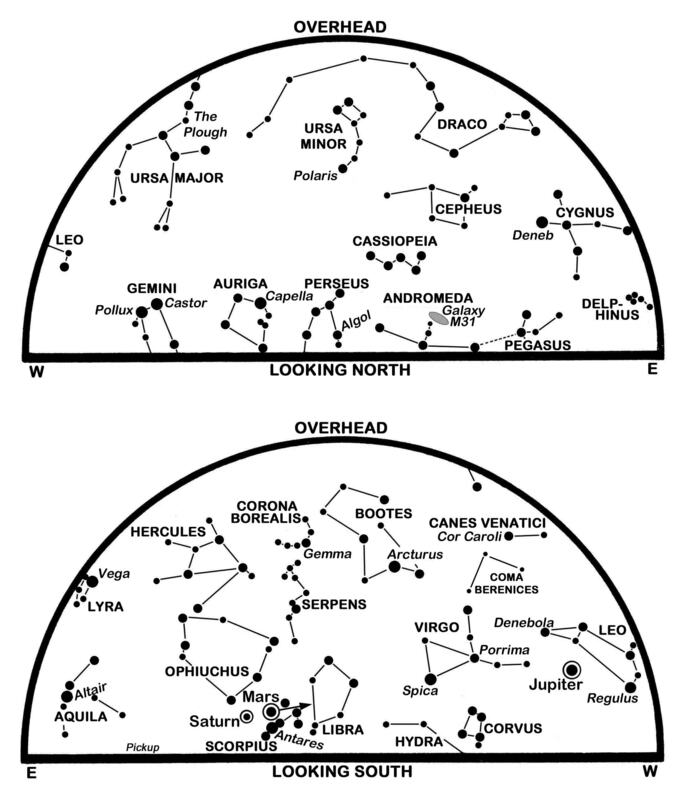 It tracks 5° westwards into the heart of Libra this month, its motion slowing to a halt on the 30th before resuming as an easterly progress that will persist for the next two years. Saturn’s disk is similar in size, 18 arcseconds at opposition, but its rings are 42 arcseconds wide and have their north face tipped 26° towards us. Not since 2003 have the rings been so wide open to inspection. It dims slightly, from magnitude 0.0 to 0.2 as it creeps westwards in southern Ophiuchus about 7° above-left of Antares in Scorpius. Third but not least in our planetary line-up, Jupiter is prominent at magnitude -2.0 in the south-west as the sky darkens at present, but sinks lower with each day and sets in the west a little more than one hour after our map times. Now moving eastwards below the main figure of Leo, it passes within 0.1° south of the magnitude 4.6 double star Chi Leonis on the 10th and dims a shade to magnitude -1.9 by the 30th. Of the other naked-eye planets, Mercury stands 24° west of the Sun on the 4th and, while well placed for observers south of the equator, is swamped in our predawn twilight. Venus reaches superior conjunction on the Sun’s far side on the 6th and is not visible either. The Moon is new on the 5th, close to Jupiter on the 11th, at first quarter on the 12th, above Spica in Virgo on the 14th, above-right of Mars on the 17th, close to Saturn on the 18th, full in the 20th and at last quarter on the 26th. 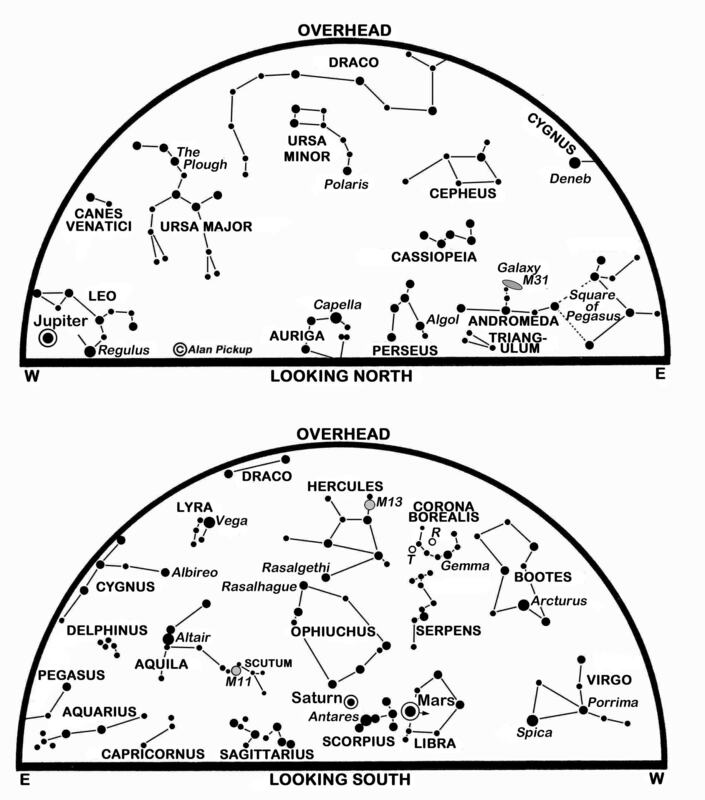 Our star charts show the stars of the Summer Triangle, Vega, Deneb and Altair, climbing in the east to south-east as the Plough stands high in the north-west. 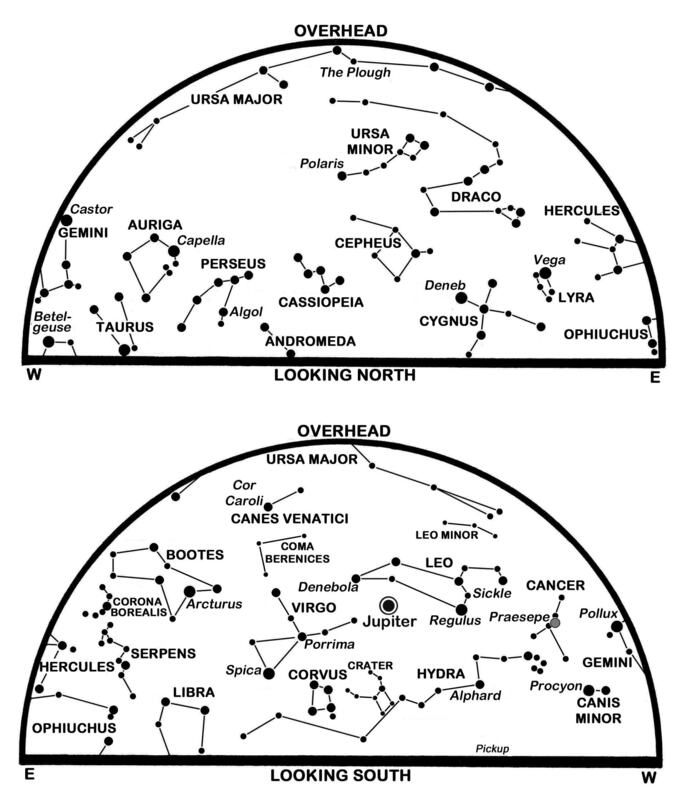 The curve of the Plough’s handle extends to the brightest star visible at our map times, Arcturus in Bootes. 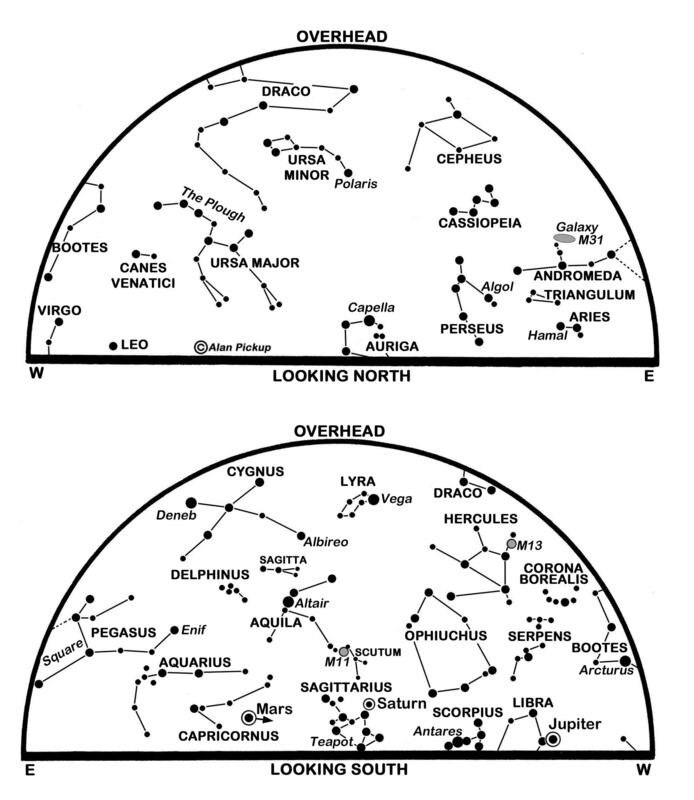 Look some 20° above and to the left of Arcturus for the pretty arc of stars that make up Corona Borealis, the Northern Crown, which, because it is incomplete, should perhaps be called the Northern Tiara. Corona’s leading star has the dual names of Gemma, for an obvious reason, and Alphecca which derives from the Arabic for “the bright of the broken ring”. At magnitude 2.2, though, it was surpassed briefly and unexpectedly exactly 150 years ago, in 1866, by the appearance of a nova (“new star”) just beyond the crown’s south-eastern edge. Now called T Coronae Borealis (or T CrB), this reached magnitude 2.0 but plunged below naked eye visibility after only eight days to became slightly variable in brightness as a telescopic object just fainter than the tenth magnitude. To much surprise it burst into prominence again in 1946 though this time it was already fading at magnitude 3.2 when it was first spotted. 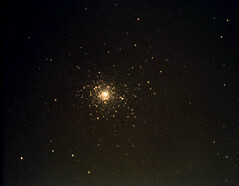 T CrB thus earned its nickname as the Blaze Star and became the brightest known of ten such recurrent novae in the sky. Studies over the past year show it slightly brighter and bluer than usual and hint that a new outburst may occur at any time, so this is one to check regularly. 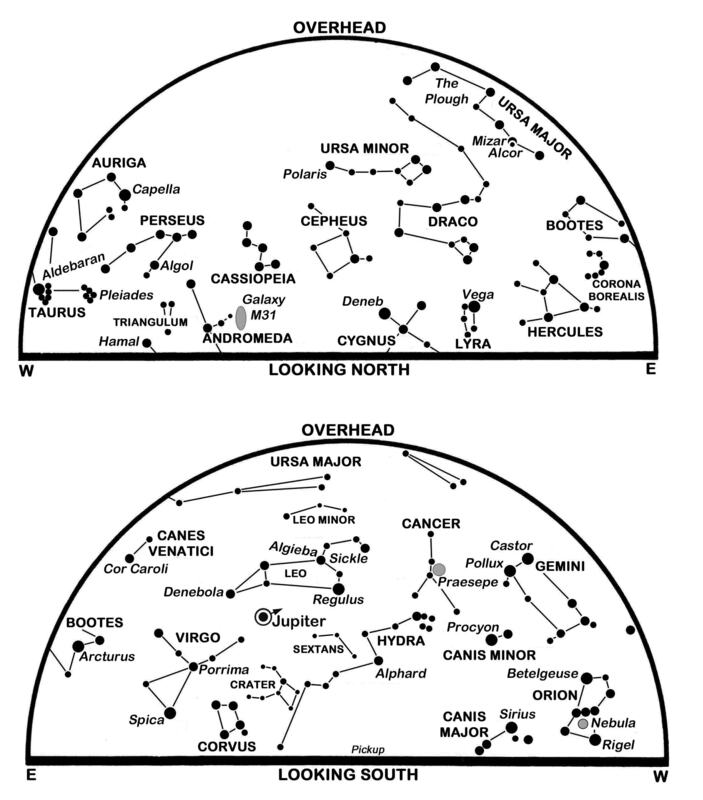 Another variable star, R CrB, is usually near the sixth magnitude and the brightest star within the crown. However, normally for a few weeks or months every few years, it fades to become a dim telescopic object when, so it is thought, clouds of soot form in its atmosphere and block its light. Strangely, it has yet to recover following a record-breaking fade in 2007 and was still near the 14th magnitude a few days ago. Despite our summer twilight, Scotland is best placed to see noctilucent or “night-shining” clouds which may appear cirrus-like and often bluish low down between the north-west after sunset and the north-east before dawn. Formed by layers of ice-crystals near 82 km in height, these are Earth’s highest clouds and able to shine in the sunlight long after our normal clouds have dimmed to darkness. This is a slightly-revised version of Alan’s article published in The Scotsman on June 1st 2016, with thanks to the newspaper for permission to republish here. Six years have passed since Mars was as close and bright as it is this month, but two other planets outshine it and a fourth, Saturn, will soon be at its best for the year. There are also two of 2014’s four eclipses but, as with the second pair in October, neither is of much interest for observers in Scotland. For the moment, our evening sky retains a flavour of stellar feast we enjoyed over the winter. Orion is still on show in the south-west at nightfall below the conspicuous planet Jupiter. Orion’s Belt now lies almost parallel to the horizon, a line along it pointing to the left towards Sirius, our brightest nighttime star, and to the right towards Aldebaran and the Pleiades in Taurus. 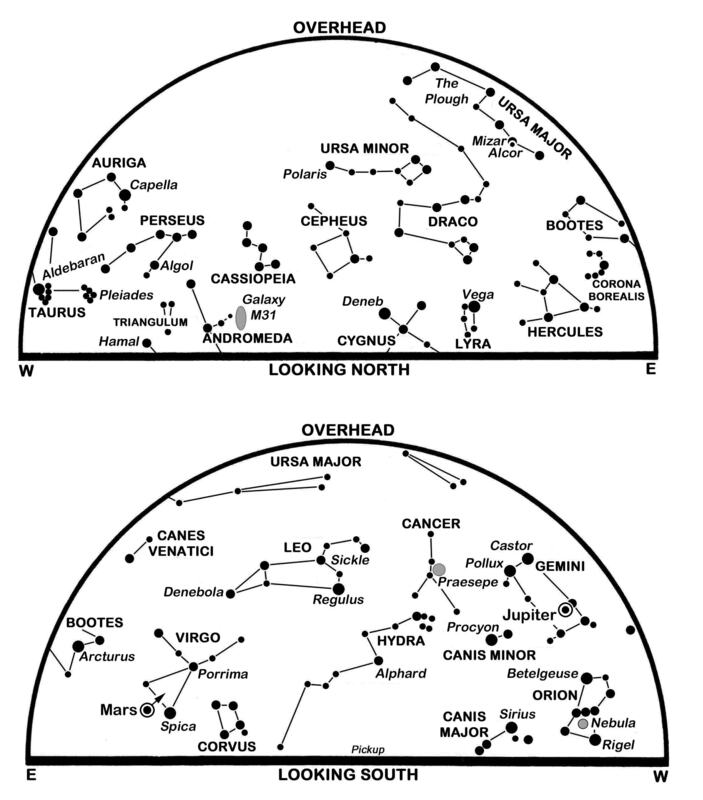 By our star map times, though, Orion has all but sunk below our western horizon. Jupiter, however, continues as our brightest evening object bar the Moon. As it slips 3.5° or seven Moon-widths eastwards in the middle of Gemini during April, it fades a little between magnitude -2.2 and -2.0 and its telescopic diameter shrinks from 38 to 35 arcseconds. 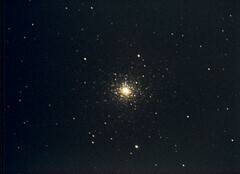 The earlier in the night that we catch it, the higher it stands and the sharper the view of its cloud-banded disk. 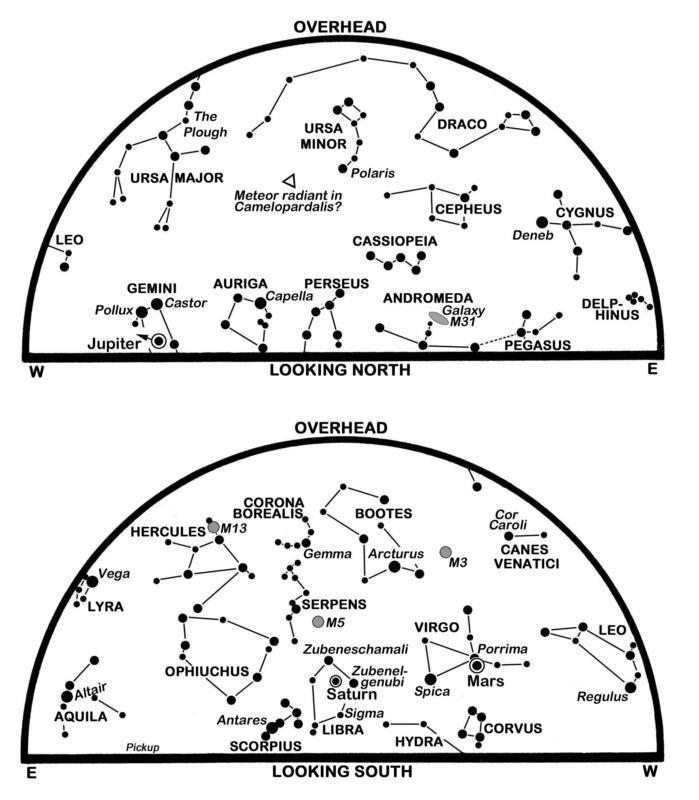 By our map times Jupiter is some 30° high in the west and on its way to setting in the north-west four hours later. The month begins with impressive views of the young earthlit Moon in the west at nightfall. It is only 5% illuminated on the 1st as it stands 14° high forty minutes after sunset. Look for it below the Pleiades on the 2nd, below the Aldebaran-Pleiades line on the 3rd and 6° below Jupiter on the 6th as it nears first quarter. Mars reaches opposition on the 8th when it lies 93 million km away and shines at magnitude -1.5 so that its orange-red beacon rivals Sirius in brightness if not in colour. By definition, it stands opposite the Sun in the sky so that we find it climbing from the eastern horizon as the evening twilight fades to pass 28° high on Edinburgh’s meridian two hours after our map times. As the arrow on our south map shows, Mars tracks 10° westwards in Virgo during April, from 5° above the magnitude 1.0 Spica today to lie 1.6° below-left of the famous binary star Porrima as the month ends. Often the day of opposition is when a planet is closest to us but Mars is approaching the Sun in its orbit and is 450,000 km closer to us on the 14th than on the 8th. Through a telescope, its ochre disk is 15 arcseconds wide and shows dusky markings and the dwindling white smudge of its north polar ice cap, tipped about 22° towards us. The full Moon lies below Mars on the evening of the 14th and is approaching Spica as it sets for Edinburgh at 06:08 BST on the 15th. Only 14 minutes before this, and while it is less than 2° above the west-south-western horizon in the twilight, it begins to enter the outer shadow of the Earth, the penumbra. Sadly, we have no hope of seeing any dimming of the lunar disk before it sets. Observers in the Americas are much better placed to view the resulting total eclipse of the Moon which is total from 08:07 until 09:26 BST (03:07 to 04:25 EDT). Sunrise/sunset times for Edinburgh change from 06:44/19:51 BST on the 1st to 05:32/20:50 on the 30th while the duration of nautical twilight at dawn and dusk stretches from 84 to 105 minutes. After first quarter on the 7th, the Moon is full during the eclipse on the 15th, at last quarter on the 22nd and new on the 29th when a small area of Antarctica and perhaps a few penguins experience an annular eclipse of the Sun. A partial solar eclipse is visible from Australia and the southern Indian Ocean. 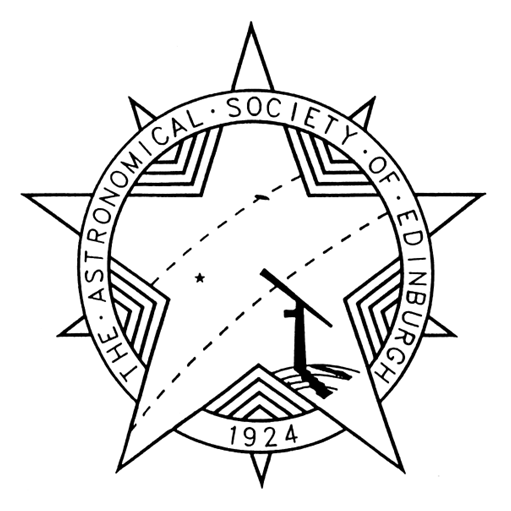 On course to reach opposition in May, Saturn rises at Edinburgh’s east-south-eastern horizon at 23:31 on the 1st and only 36 minutes after sunset by the 30th, climbing to pass 18° high on the meridian four hours after our map times. Improving from magnitude 0.3 to 0.1, it edges westwards in Libra and draws ever closer to the Moon overnight on the 16th-17th when Saturn’s disk is 18 arcseconds wide while its stunning rings span 42 arcseconds. Mercury is hidden in the dawn twilight until it passes around the Sun’s far side on the 26th. Venus, brilliant as a morning star, rises in the east-south-east seventy minutes before sunrise on the 1st and in the east only 51 minutes before the Sun on the 30th. Dimming from magnitude -4.3 to -4.1, its gibbous disk shrinks from 22 to 17 arcseconds in diameter. It is less than a month since results from NASA’s WISE spacecraft appeared to rule out any Jupiter or Saturn-sized planet lurking unseen in the outermost solar system. Now we learn that a new dwarf planet, dubbed 2012 VP113, has been found to have an orbit that comes no closer to the Sun than 80 times the Earth’s distance, further than any other known object in the solar system. Thought to be a ball of rock and ice perhaps 450 km wide, it may be six times further away at its farthest, and take perhaps 5,000 years to complete each orbit. Surprisingly, 2012 VP113’s orbit is similarly orientated to those of some other remote bodies, including the only other comparable object, Sedna. There is speculation that this is because they are influenced by a larger undiscovered world, perhaps a super-Earth, even further out. This is a slightly-revised version of Alan’s article published in The Scotsman on April 2nd 2014, with thanks to the newspaper for permission to republish here.